CPS, Syntectics and other major ongoing programs for creativity development - their programs, methods, tools and techniques. Three major current thrusts in program development: Problem-Finding, Imagery/Intuition and Computers. Helpful background for facilitating and instructing CPS. Editor Parnes explains: "The volume will serve all who want an expanded understanding and appreciation of their own creative processes and how to nurture these in themselves and others - in teaching, managing, facilitating, parenting or mentoring - along what I call an infinite continuum of possible growth in creative ability. 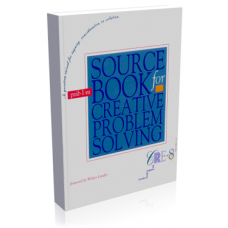 Source Book for Creative Problem-Solving is a "mini-encyclopedia" for trainers, teachers, practitioners, managers, parents, scholars, students and their libraries. It contains the most diverse, relevant and representative selection available of articles from half a century of effort in creativity development.